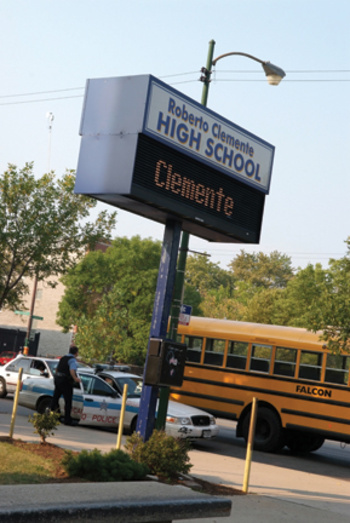 A youth advocacy group is calling on Chicago aldermen to pass a student safety act similar to one in New York City that forces the school district to reveal the number of arrests, suspensions and expulsions per school every quarter. Data published as a result of the New York City ordinance have led to important revelations, such as the finding that at least one black male student is arrested in school each day, says Mariame Kaba, founder and director of Project NIA. On Wednesday, Project NIA released a report on arrests in schools, but the information was difficult to get and came from the Chicago Police Department and not CPS, whose officials say they don’t keep tabs on arrests. The report reveals that student arrests are a major concern. Of the 27,000 juveniles arrested in Chicago in 2010, a fifth of them were taken into custody at school. More than two-thirds of those arrested were black and 75 percent were male. “It clearly shows that black males are being targeted,” says Frank Edwards, a professor of sociology at DePaul University and a volunteer with Project NIA. He says that black students are 1.6 times more likely to be arrested at school than their peers. Kaba says she’s optimistic that a student safety act could fly in Chicago. She notes that Mayor Rahm Emanuel has made data transparency a big push. But at CPS, the idea might be controversial. Getting student suspension and expulsion information at the school level has always required a Freedom of Information Act request. In recent years, much of the information is redacted because of privacy concerns. Also, police have a strong presence in schools and principals are attached to that. Most high schools have two policemen assigned to them every school day. Earlier this year, CPS officials tried to convince principals to give them up in exchange for extra cash. But few principals took the offer. The number one offense among student arrests is simple battery, which is usually fighting. Other top reasons include drug abuse violations and disorderly conduct. Few students are arrested for violent crimes. Project NIA staff are still trying to obtain school-level data from police. For the most part, the communities with many juvenile arrests also have a lot of school-based arrests. Austin and North Lawndale are exceptions, as they are among the top five communities in juvenile arrests, but not in school-based arrests. Kaba says the situation bears investigation. In addition to more transparency, Kaba also would like to see more funding for restorative justice programs. The current student code of conduct calls on schools to use restorative justice techniques such as peace circles and peer juries. But the strategies have never taken root in a wide number of schools, since many principals and teachers don’t know how to use these techniques and there’s little money to train them. In addition, some school staff are not convinced that the techniques are effective. Naomi Milstein, who runs the restorative justice training programs at Alternatives, says that there’s more awareness and desire to do restorative justice. Yet training is hard to come by. Also, since turnover is high in CPS, schools might train one set of staff members but then need to train new people a few years later. The student code of conduct is currently being rewritten, and Kaba and Milstein would like more explicit directives in terms of restorative justice. Kaba and Project NIA also are working with state legislators on getting juvenile arrest records expunged. Though most think such arrest records are not accessible, they often show up years later when prospective employers are doing background checks. Kaba learned this the hard way. A young woman whom she worked with called her, upset that she had been denied a nursing license after attending nursing school–based on a criminal record. At first, the young woman had no idea of the basis of the denial, but then, Kaba says, she remembered that she had been arrested after getting into a fight on her school campus. Kaba, who knows the system, was able to get the record cleared up within a week, but she says many young people don’t have an advocate like her. Jesus Velazquez got caught at school with a marijuana pipe in his backpack. What happened next is exactly what shouldn’t take place if a school district’s goal—or, from a larger perspective, a community’s goal—is to get kids who make dumb mistakes back on track. Jesus was suspended for 10 days, referred for an expulsion hearing and sent to a diversion program instead of being expelled. He ended up failing most of his sophomore classes and is now facing a fifth year in high school. Surely this was a case in which a non-punitive response—mandatory drug education or participation in community service—made better sense. Students caught with an ounce or less of marijuana are more likely to be arrested in school than a student who starts a fight or steals. Hundreds of teens are arrested each year for drug offenses involving pot—offenses that may warrant only a ticket for adult Chicagoans.